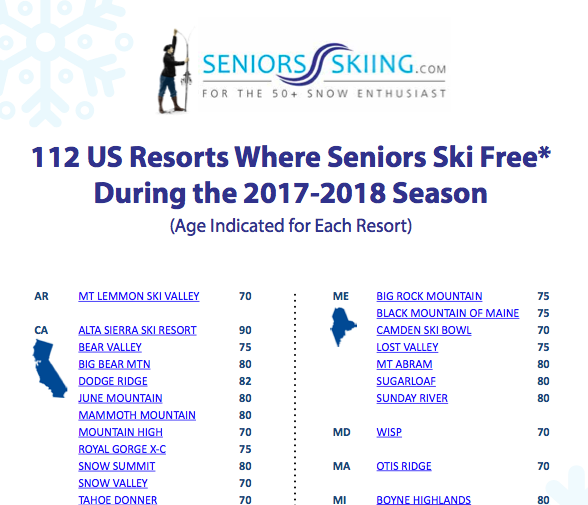 Following Last Week’s Publication Of SeniorsSkiing.com’s List Of US Resorts Where Seniors Ski Free, We Received Numerous Corrections From Readers. Mad River Glen in Vermont and Hunter Mountain in New York don’t have freebies; Bear Valley in California and Gunstock in New Hampshire do. The list has been updated to reflect those and other changes. Some areas have prices so low that they’re virtually free. For example, Snow Basin in Utah has a $99 season pass if you’re 75. It’s not “free,” but it is quite the bargain. The footnote on the last page had been altered to cover that type of bargain. We’re confident that there are other such bargains we haven’t captured. 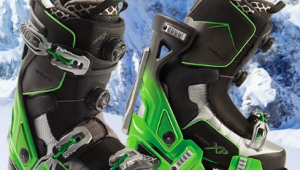 As you come across places offering free or “virtually free” skiing, please let us know. We’ll inform readers as the information comes in. In the meanwhile, make the most of the list and suggest that other senior skiers subscribe so they, too, will have access to that list and other valuable Subscriber Only content. If you’re a current subscriber, access the full list by looking under the COMMUNITY>SUBSCRIBER-ONLY CONTENT menu picks. If you aren’t a subscriber, give us your name and email address (free by the way), and you’ll be good to go. I can’t find the virtually free list. Under the COMMUNITY Menu pick on top. Go to Subscriber-Only Content. It’s there. If you are not a subscriber, join us; it’s free. Powder Mountain Resort in Utah has free skiing for 75+. It’s on the list, Herb. Powder Mountain is great! Missing is Whitefish Mountain Resort in Montana where skiing is free at age 70. It’s on the list, Jim but with incorrect age. We’ll lower to 70. Thank you! I was 82 last year at Telluride and was given a free season pass. Thank you Howard. Will add Ta-Hell-You-Ride to the list. Good catch! Thanks, Roger. Found it on their website. Will add to the list. Suggest you change your browser. It’s there, you should be able to download it. If you have further problems, please email me directly at [email protected] and we will see what can be done. Bear Valley Ski area CA will comp skiers over 70 yo with valid ID. It is a great place to ski in the middle of the week with challenging and fun runs to ride or ski on. Anything reduced or free in Canada or Europe? Is free skiing available in Colorado if you’re over 80?? You betcha. Purgatory, Ski Cooper, Sunlight Mountain, Wolf Creek. 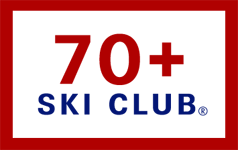 I’m 70 and want to know where I can ski free. All I get is a screenshot of free skiing in six states. How can I view the rest? Thanks! Try again. Should work now. How do I access the table listing discounted senior skiing? Hey Sam: You can download the PDF by clicking on the third box from the left at the top menu bar. Just follow the prompts. lodging, equipment, etc.. then the lift tickets are just a fraction of the cost of skiing. Skiing is one of the best ways to stay in shape in the wintertime months, so could it be argued that it can offset the costs of healthcare of an older population? That could reduce the cost of Medicare– slightly I admit, but every little bit helps. Hello Robert: Most resorts that offer free or almost free skiing for seniors start at an average of 67 years. Most start at 70. Some older than that. If you find a resort that offers free skiing at 50, please let us know. We’re buying a condo nearby. The mid-week daily lift ticket price for 65-74 at Bear Valley, CA, is $33, compared to an adult rate of $79. Weekend and Holiday for seniors is $39 versus $95. While certainly not free, our view is that those prices are pretty good. But, you’re right, there are no serious discounts at all for season passes for seniors. Senior skiing was fabulous idea. Señor skiers need to contact Alterra Mountain Co, [email protected] and request that Squaw/Alpine Meadows offer free skiing to skiers age 80 and over. Since they control 14 resorts + Heli skiing it would be good public relations to us seniors and show the senior skiers how well Alterra Mtn. Co wishes to treat us.